Gum tissue and bone normally fit snugly around teeth, but when periodontal disease occurs, the gum tissue and bone are destroyed and large spaces called pockets form around the teeth. If left untreated these periodontal pockets deepen forming larger areas for bacteria to live in which results in further bone and tissue loss until little support is left, and teeth may need to be extracted. The pocket reduction procedure is employed to better access and clean deep into the deep pocket areas not reached by root planning and scaling alone to remove bacteria. At the same time this procedure is performed the disease may also be treated with antimicrobial agents. During this procedure the gum tissue is folded back and after the procedure is completed the gum tissue is once again secured back into place with sutures. Most pocket reduction procedures usually are supplemented with bone grafting and other regenerative techniques. These procedures restore bone and ligaments that have been lost by periodontal disease. Bone grafting material (i.e. demineralized freeze dried bone, a patient’s own bone, synthetic bone inducing particles) along with membranes and tissue stimulating chemicals are used to help grow new bone and ligament around your teeth. The employment of membrane barriers is often an essential component part of a regeneration procedure which helps new periodontal tissue growth in a protected environment. 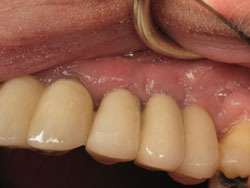 Areas once thought to be hopeless such as areas of bone loss between the roots of teeth (furcations) which rob teeth of essential support can be greatly aided with bone grafting and barrier membrane applications to amplify support for these teeth thus decreasing the chance of tooth loss in these cases. This procedure is used to treat gum recession and cover tooth roots with a tougher more durable (keratinized) gum tissue, and creates a more pleasing cosmetic appearance to root surfaces. Different grafting materials (tissue bank tissue, membranes, donor tissue from another site) can be used to establish a new protective gum tissue. This newly created gum then covers exposed roots and enhances esthetically visible areas with a healthy vascular bed of gum tissue. Tooth decay or the fracture of a tooth under the gum line may require a surgical procedure to procure additional tooth structure for your restorative dentist to properly place a cap or filling. This periodontal procedure discloses additional tooth below the gum by removing some bone and redesigning the surrounding soft tissue. This procedure is sometimes used to improve gummy smiles where your teeth appear short because of being covered by too much gum tissue. By the removal of excess gum and sometimes bone, more of a natural smile and improved esthetics can be attained. When teeth are lost indentations can occur in the jawbone because the bone is these areas recede leaving a lesser quantity and often poorer quality of bone. These areas are often esthetically unpleasing when it occurs under a bridge or next to adjacent remaining teeth leaving either the tooth to be replaced to appear too long, or leaving the extraction site with large depressions. This lack of bone in an extraction socket can compromise the use of a future dental implant placement because of inadequate bone quantity or quality. This defect area can now be regrown with excellent quality bone either at the time of the tooth extraction or later on. This procedure also can allow for the correction of a ridge deformity (under an existing prosthetic bridge) as well as growing new bone where there is inadequate bone to allow for the placement of an implant to replace missing teeth. Another form of regeneration which is used to build or rebuild sites of additional bone in the upper jaw where teeth have been extracted under the maxillary sinus area is called a sinus lift procedure. In these areas where teeth are extracted, the bone may not be in function and the sinus cavity can expand eliminating valuable bone which would otherwise be used for the placement of dental implants .This surgical procedure adds and develops bone in that sinus (air sac) site and is called a sinus lift procedure. The bone which is added to the sinus area under the sinus membrane stimulates the growth of new replacement bone. This newly developed bone can take 6-9 months to mature before dental implants can be placed in it. If you are missing teeth dental implants made of sterile titanium can provide a replacement for one or more natural teeth. This procedure can greatly enhance the preservation of the remaining bone where the implant is placed. Proper placement of dental implants takes careful planning. To ensure this Dr. Koltun works closely with your restorative dentist and may utilize one or more additional techniques (sinus lift augmentation, bone grafting, Simplant C.T. scans) to ensure successful implant placement. Dr. Koltun draws on his nearly 20 years of hospital and university teaching experience when carefully planning each implant case. 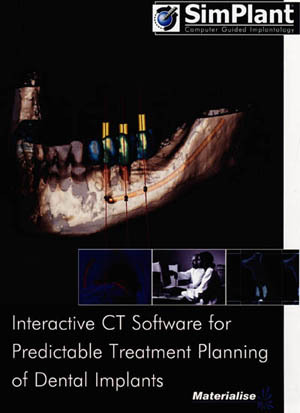 Dental x-rays often do not provide the exacting information needed for some sensitive surgical procedures. C.T. scans however allow the surgeon to evaluate bone quality, quantity (density) as well as the location of important anatomical structures in a more exacting way. Important site locations such as the mandibular nerve and the maxillary sinus must be carefully identified and accounted for when planning the best possible placement of dental implants. Simplant is a specially designed computer program which digitally formats a C.T. scan allowing for a precise 3 dimensional view of the jaw area which renders exacting study guides needed for precise implant placement. 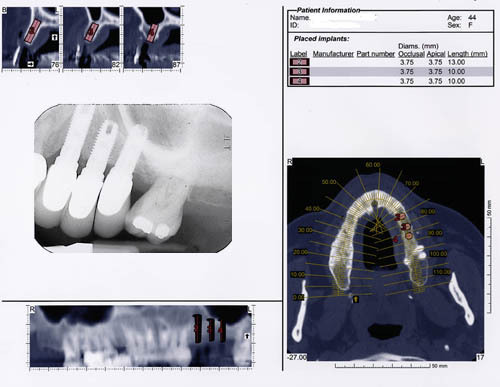 This methodology also provides accurate resource information to help in avoiding collision with important nerve structures while placing dental implants. This leading edge technology, allows Dr. Koltun to ensure the closest to ideal result for implant placement and adds invaluable information while working closely with your restorative dentist. were all used to carefully plan implant placement. Periodontal maintenance is a key element for the long term success of your periodontal treatment. Careful oral hygiene at home coupled with a scaling of the teeth above and below the gum line can help control the recurrence of periodontal infections and help in increasing the health of your dental implants. At the time of the maintenance visit careful periodontal charting, cleaning and any supplemental therapy if needed, will be performed. The time intervals for treatment are often determined by individual needs.